Sioux Falls, SD—Andre Lee’s power play goal with 6:59 remaining in regulation proved to be the game winner as the Sioux Falls Stamped topped Sioux City 2-1 in Game one of their best-of-three first round series at the PREMIER Center. Game two of the series takes place Wednesday night in Sioux Falls. In a tightly contested game the Herd got a first period goal from Jared Westcott and Jaxson Stauber was solid between the pipes stopping 12 of 13 shots for his first career USHL playoff win. The game began like you would expect the first game of a playoff series to start, with both teams very cautious in the early goings. Sioux Falls was outshooting the Musketeers 7-3 midway through the period but the game remained scoreless. The Stampede got the first goal of the playoffs at 15:40 of the period when Ryan Sullivan took the puck up the right-wing boards and fed the puck through the slot to a streaking Jared Westcott who tipped the puck into the back of the net for a 1-0 lead. The Herd outshot the Musketeers 10-5 in the first. It was much of the same to start the second, but the Musketeers were finally able to break through at 8:03 when Blake Biondi tallied his first of the playoffs to tie the game. Biondi took a pass in the high slot and wristed a shot through traffic that beat a sliding Jaxson Stauber to make it 1-1. That goal gave the Musketeers energy, but Stauber was solid and made some big saves to keep the Musketeers off the board and keep the game tied after two. Sioux City outshot the Herd 7-5 in the period. The intensity kept up in the third as the game remain tied through the first ten minutes of the period. Things got interesting in the final eight minutes of the contest. With the Stampede already on the power play, Artem Ivanyuzhenkov took a stick to the face putting the Stampede on a 5-on-3 power play for 45 seconds. The Herd would take advantage when Max Crozier sent a pass in front of the net to Andre Lee who tipped the puck through the pads of Ben Kraws for a 2-1 advantage and sending the Stampede faithful into a frenzy. The Herd put on great pressure during the remaining 3:30 of the high sticking penalty, but Kraws made some big saves and it remained a 2-1 game into the final 1:45 of the game. 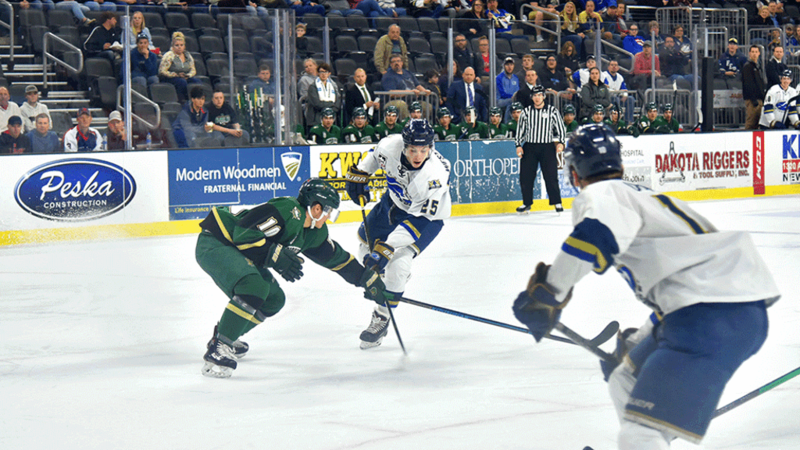 Sioux City pulled Kraws for an extra attacker, but the Stampede defense was solid and blocked shots and cleared the zone to hold off the Musketeers and earn a Game 1 victory. Sioux Falls outshot the Musketeers 11-1 in the third period and 26-13 in the game. The Stampede finished the night 1-for-4 on the power play while the Musketeers were 1-for-3. Game 2 of the series takes place Wednesday night at the PREMIER Center at 7:05 PM. Tickets are available at the PREMIER Center or through Ticketmaster.